Scholars differ on whether religion increases or decreases family cohesion, and there is ample research to support both viewpoints. While there are arguments for both sides, only you and your family can decide what's right for you. How Does Religion Increase Family Cohesion? A number of studies have examined the role of religion in holding a family together. Many have found that being part of an organized faith may offer community and emotional stability to a family, helping the members support one another in difficult times and giving the parents guidance about their marriage and parental responsibilities. A study of 90 African American families published in the Journal Developmental Psychology examined the role of religion in family harmony. 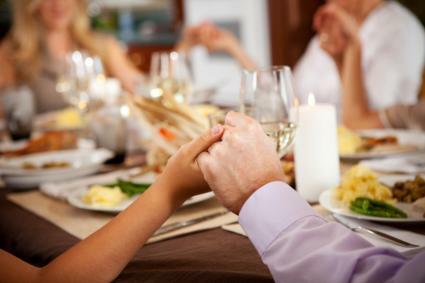 The study found that more religious parents had more cohesive family relationships. According to this research, more religious parents had fewer conflicts in their marriage, and the adolescents in these families were better at regulating their emotions and actions. Another study in the Journal of Social Behavior and Personality looked at how filial piety, or being a very religious son or daughter, affected the family relationships of 240 Chinese men and women. This study found that certain religions, especially Buddhism, encouraged filial piety, and that children who were more religious were better connected to their families. The researchers believed that this was the result of the religious participants being more empathetic, rather than the direct result of being religious. The journal Family Relations published a study examining whether religion had a beneficial effect on family life. The study, which followed more than 200 married men and women of 20 different religions living in urban settings, found that those who were religious reported that they had stronger families. The researchers believe this is due to the community support provided by organized religion. An article in the Journal of Family Psychology examined 94 different studies about family and religion, all conducted since 1980. The article found that as a general rule, religion had a small but distinct positive influence in helping couples avoid divorce. It also found that conservative Christian parents were slightly more likely to use corporal punishment when disciplining their children, but some of the studies cited also indicated that children from religious families may be better adjusted. How Does Religion Decrease Family Cohesion? While many studies have asserted that there is an increase in family cohesion among those with a religion, others have found conflicting results or challenged the qualities that hold these families together. Some studies have also asserted that for individual family members who fall outside the religious norms of the family, such as those who challenge the faith or who are homosexual, this rule of family cohesion no longer applies. A study published in the Review of Religious Research found that when gay or lesbian family members attended a religious family wedding, they perceived themselves to be outsiders rather than part of a cohesive family group. The researchers indicate that conservative religious faith may negatively impact family cohesion when some family members do not conform to standards of that religion and that more liberal and diverse religious groups contribute better to healthy family relationships. A study in The Journal of Black Psychology examined the stress levels and faiths of 318 African American single mothers. Women who were religious reported gaining comfort from their faith, but women who were not religious had the lowest levels of stress. According to the Center for the Advanced Study of the Behavioral Sciences, higher levels of parental stress can have a negative effect on children. An article in the Journal for the Scientific Study of Religion posits that while many studies indicate that religious families are more likely to stay together, few studies have actually examined the quality of those familial bonds. They suggest that more research is needed to determine whether religion actually increases family cohesion in a healthy way. Another article in the Journal for the Scientific Study of Religion examines how parents of various faiths define positive behavior in children and how this contributes to the cohesion of the family. The article argues that more conservative Christian parents define well-behaved children and adolescents as obedient and that they may discourage autonomy in their children. This may indicate that while family relationships are harmonious, they are not necessarily healthy for children. Once again, the article indicates that more research is needed in this area. As a rule, organized religion can present a high level of community support for a family. Religion can help guide a family about the values and behaviors that are "good" or "bad" for the group. People who are religious may be more connected to one another and possibly more empathetic. In some religions, the sense of moral "right" or "wrong" is stronger than the bonds of the family, leading families to ostracize members who do not conform to the moral standards. In non-traditional families, such as those lead by single mothers, religion is both a source of support and a source of stress. As with all religious and family decisions, the role of faith in your family is a deeply personal choice. Understanding the research can help you make an informed decision about whether and how to incorporate your religion into your home life, but ultimately, your parenting instincts will guide your choice and will protect your family bond.